The CMT 130TC On-Demand Book Trimmer incorporates sophisticated automation into the finishing trim operation of perfect bound books. The book trimming process no longer needs to be a labor and cost intensive task. 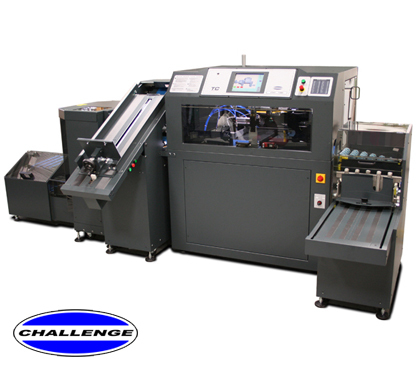 The Challenge CMT 130TC provides professional high-quality trimming for the wide range of book sizes in today’s publishing marketplace. The CMT 130TC is designed and built in Michigan, USA. Powerful hydraulic cutting and clamping pressure effortlessly cut up to a 2” thick book. A distinct clamp design and a bi-directional knife stroke assures that the knife always cuts into the spine providing a clean damage-free book finish. The CMT 130TC utilizes servo and stepper motors to accurately position books for cutting. Full digital control of the set-up allows book size changes in less than 10 seconds. There is no need to perform manual adjustments or exchange book clamps. The CMT 130TC exclusively features simultaneous in-line and near-line feeding capability. - Thickness range up to 2"